Old Pali: A sound indicating origination and movement (ma = and to, make; mo = and out, move; mu = and up, mutter; mi, me = and in, and here, my, mine), transition and unification (and, to, as in English "'n" sugar'n spice; 'sukha.m-dukkham'), and termination (word ending '.m' as in Pidgin English '-um'). The New Shorter Oxford English Dictionary: the thirteenth letter of the modern English alphabet and the twelfth of the ancient Roman one, corresponding to Greek mu, Semitic mem. The sound normally represented by the letter is a bilabial nasal consonant, usu. voiced, though with an unvoiced ending when followed by an unvoiced consonant, and able to be used syllabically . . . rhythm, spasm, schism. 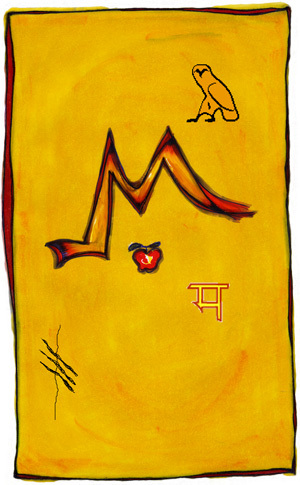 ma) (abbreviation of mamma) Mother. Also, Mrs; used as a form of address to a middle-aged or elderly womanother than one's mother "P.G. Woodhouse: Did Ma Purkiss make a speech?